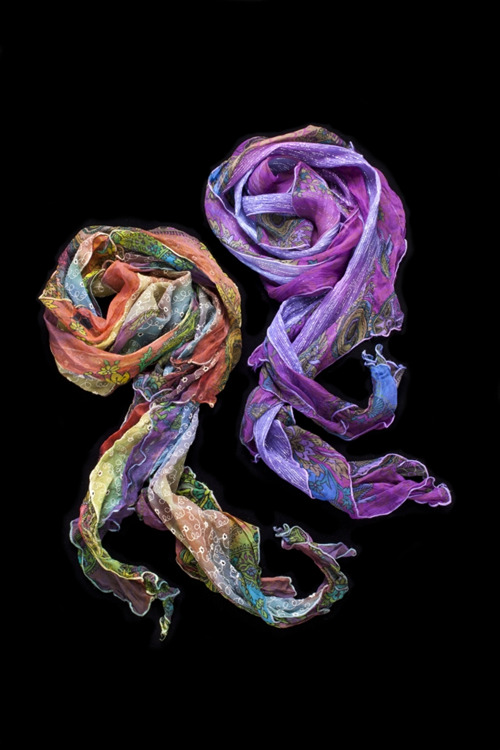 Every silk Cocktail scarf is unique. 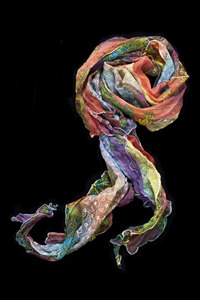 Sewn of a mix of printed and textured silk fabric and hand dyed in combinations of three colors to achieve a beautiful complexity. 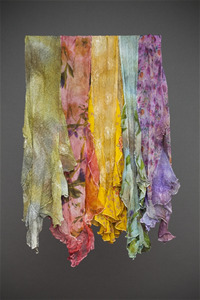 This shorter silk scarf has proven to be a best seller. It is offered in 6 color-ways. The jacket shown here is a one of a kind hand dyed piece made of vintage silk saris. It is decorated with applique and overstitching. The style is called the Swallowtail Jacket. Dyed in the color - Winter Grass. This beautiful jacket is made of hand dyed silk and vintage kimono silk. It has applique and quilting and is dyed in the color raspberry smoothy.